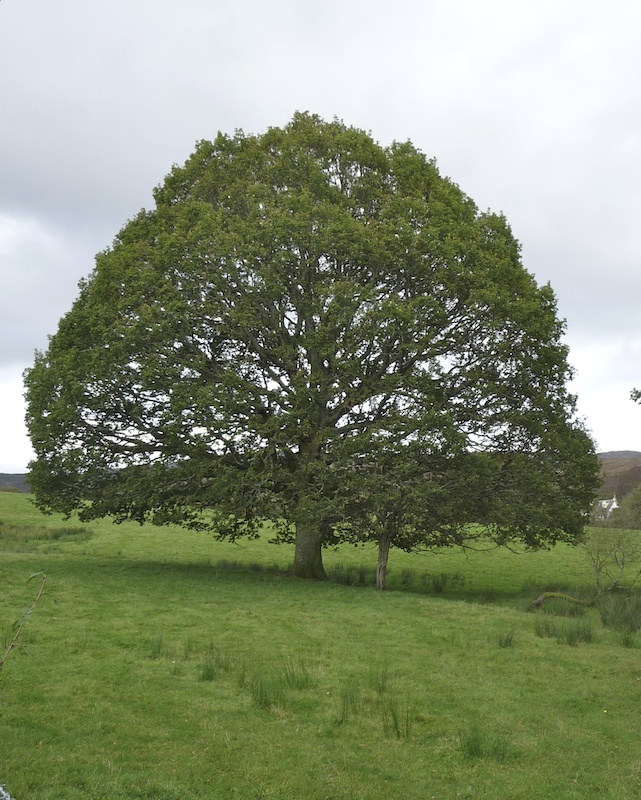 Two species of oak are native to Britain: the pedunculate oak (Quercus robur) and the sessile oak (Quercus petraea). They are, in fact, members of the beech family, Fagaceae. You can tell the two species apart by the length of their leaf stalk – the sessile oak has a longer (1-2 cm) leaf stalk, whereas that of the pedunculate oak is less than half a centimetre. The holm oak (Quercus ilex), also known as the holly oak, was introduced to Britain in the late 16th century; it is an evergreen, with spiny leaves like its namesake. The turkey oak (Quercus cerris) is a relatively recent introduction which originates from central southern Europe. A fast-growing tree, it was planted in Britain during the 18th century to create shelterbelts and avenues on country estates. Another newcomer is the red oak (Quercus rubra). A native of North America, it is admired for its attractive leaves. Both male and female flowers appear on the same tree: the male flowers are like catkins, while the tiny female flowers form at the junction between the leaf stalk and twig. In ‘mast years’, which occur every three to five years, large number of acorns are produced – sometimes up to 50,000. 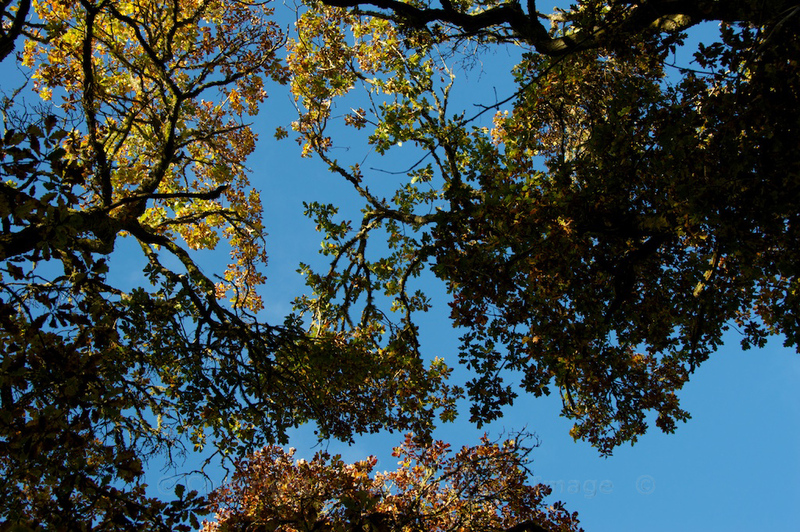 Oak trees support a wealth of wildlife, including birds, mammals, insects, spiders, lichen and fungi. Jays feed on the acorns and are instrumental in distributing them far and wide, thereby assisting the gradual spread of an oak wood. Individual trees known as Gospel Oaks can be found in some old woodlands in southern and western England. Traditionally, the Gospel was read aloud under these trees during Beating of the Bounds ceremonies every spring. Even in more recent times, a branch of oak was considered to have magical powers, as was any mistletoe found growing on an oak tree. Carrying an acorn guarded against disease and promoted long life, while planting an acorn at the time of a new moon was said to bring wealth. If an acorn was placed in a window, it was believed to protect the house from a lightning strike. Oak trees were venerated by the Romans, Celts, Greeks and many Scandinavian peoples who associated them with their supreme gods. Victorious Roman commanders wore crowns of oak leaves to mark their triumph. For centuries, oak has been used for furniture-making. Some forms of it are especially sought-after by furniture makers and wood carvers. Bog Oak, as its name suggests, has lain in a peat bog since prehistoric times, and has a blackish colouring, while the markings of Brown Oak are created by the Beefsteak fungus (Fistulina hepatica). The oak has been useful to humans in so many ways: the sawdust was (and still is) used for smoking food, the bark for tanning leather, acorns were fed to pigs, and the wood itself has been used for iron smelting and charcoal making. On a larger scale, oak panelling was the hallmark of a prestigious residence in Tudor times – a fashion which had a devastating effect on Britain’s oak woodlands, as more and more trees were felled to build houses and furnish them. In 1992 a Bronze Age boat was discovered near Dover. Dating from around 1575 BC, it had been constructed from oak planks lashed together with yew strips. Part of the boat still lies buried under some buildings, because it was considered to be too dangerous to excavate it in full; the remainder is in the Dover Museum. Shipbuilding, especially in the Middle Ages, called for the supply of oak timbers on an unprecedented scale. The Mary Rose, pride of Henry VIII’s fleet, was constructed almost solely of English oak; around 600 trees were cut down in order to build her. The uplands of mid-Wales are known for their beautiful oak woodlands, which are spectacular in every season. 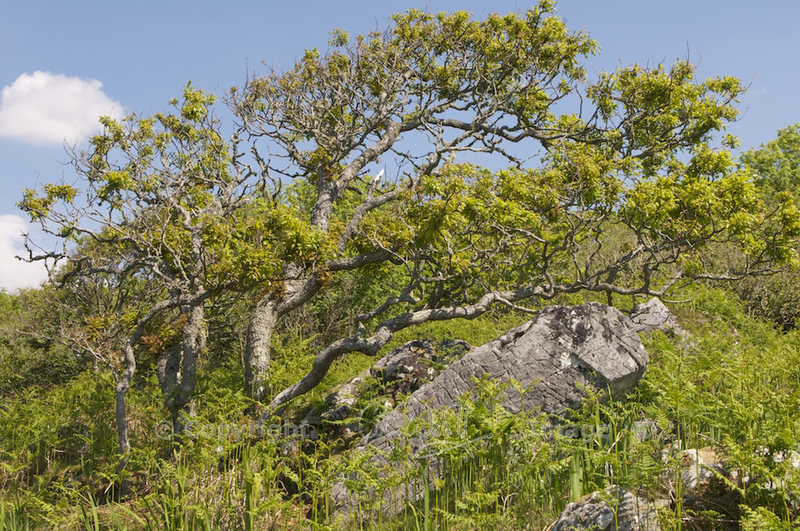 Also called the Welsh oak, the sessile oak has been designated the national tree of Wales. During the English Civil War, Charles II is said to have hidden in an oak tree near Boscobel in Shropshire, to escape from Cromwell’s soldiers. (In fact, Charles II is reputed to have hidden in so many oaks dotted about England that he must have spent more time in a tree than the average squirrel). An annual festival on 29th May known as Royal Oak Day or Oak Apple Day commemorates the restoration of Charles II to the throne in May 1660. The day is still celebrated in a few English counties: a ‘Garland King’ rides through the streets of Castleton in Derbyshire, covered from head to toe in a cone of flowers. The flowers are then removed and placed on the church tower. It’s quite likely that the roots of these ceremonies date back much further, to pre-Christian times. Do you know of any ancient or impressive oak trees in your locality? I would be interested to hear about them. Read about the beautiful and ancient oak woods of Taynish, or stand beneath the venerable Birnam Oak at Dunkeld. Oaks are magnificent- and what a great idea for a series. Well-done! Thank you very much! I’m looking forward to writing the next one. There’s so much I didn’t know about oaks! I laughed at the Charles II comment, I had heard of him sheltering in an oak tree but didn’t realise so many laid claim to his apparent habit. What a wonderful tree the oak is, and such beautiful leaves. I was very interested to read about the druids, I hadn’t realised they didn’t write anything down, and I wasn’t aware of their strong connection to oak trees. I’m not aware of any outstanding specimens in Perthshire, although there are quite a few oaks in the area. This is a great post Jo and I’m looking forward to more in the series! Thank you very much Lorna, I’m glad you enjoyed it. I found more about oak trees than I expected! I’ve always been fascinated by the druids, I suppose because so little is known about them. Real druids, I mean, as opposed to the kind that take part in modern-day Eisteddfods. I’m looking forward to researching the next one – not sure which species yet! I can’t wait to see which one comes next, I love your idea of celebrating our wonderful trees. I like your idea of a series on native trees! When I taught dendrology (identification and natural history of woody plants) I tried to present the information in a manner similar to your post, but with greater emphasis on field identification. English oak was on my plant list, as it performs fairly well in this area as a landscape specimen. I have also planted a few in the “wild” in an effort to provide an additional food source for wildlife. Excellent research and presentation!!! Looking forward to your next post.